Early to bed and early to rise…and work on work plan and budget. I got quite a bit accomplished and decided to join John and his boys on the Skyline Trail. 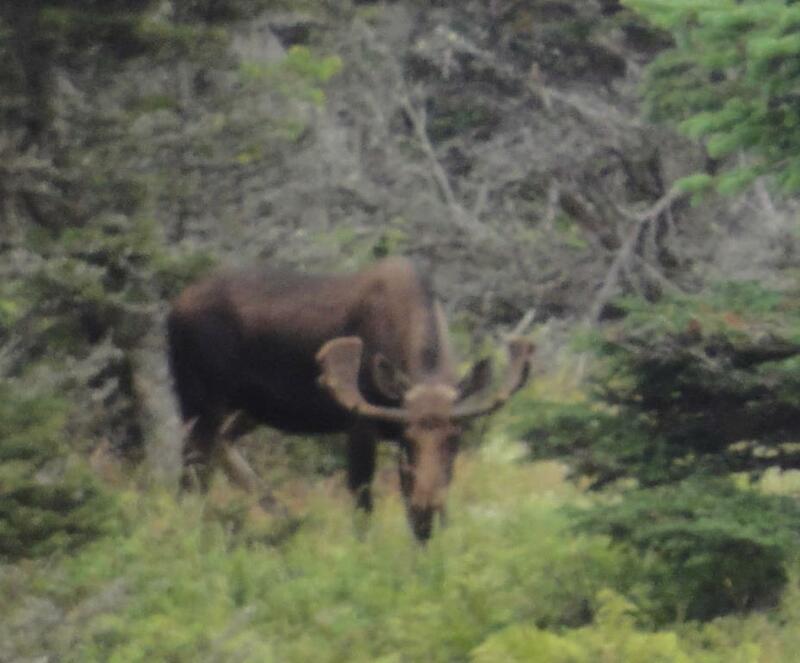 The trail is a lovely 10 km loop that goes through some very interesting parts of the Cape Breton Highlands. Spruce bud worm wiped out most of the spruce/balsam forest in the 70’s and it is taking some time to come back. What is left is a lot of open space, quite a bit of pioneer paper birch and young spruce (black and red), and balsam fir still struggling to come back. 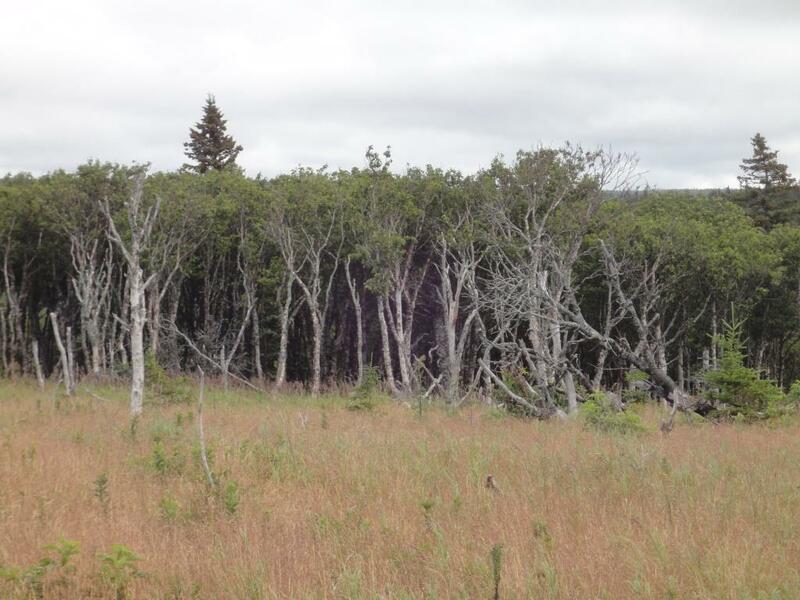 This is great habitat for moose and there is some thought that their increased numbers are inhibiting the return of the climax spruce and fir. The Quinns: Eli, Leo, and John…and I’m in the back. 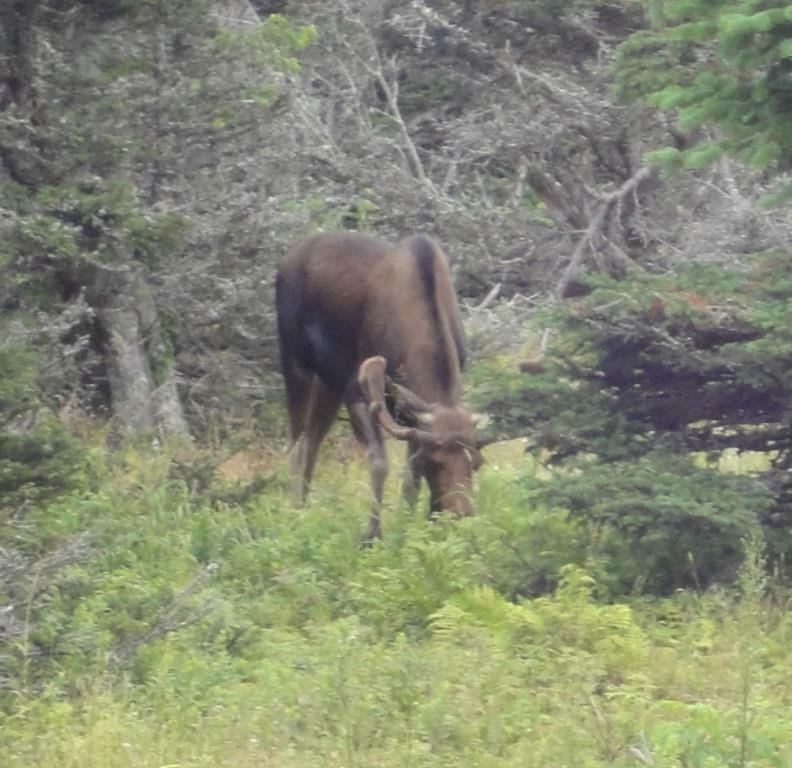 The majority of the first leg of the hike is in prime moose habitat and we were rewarded with the sight of a bull moose munching near the trail. 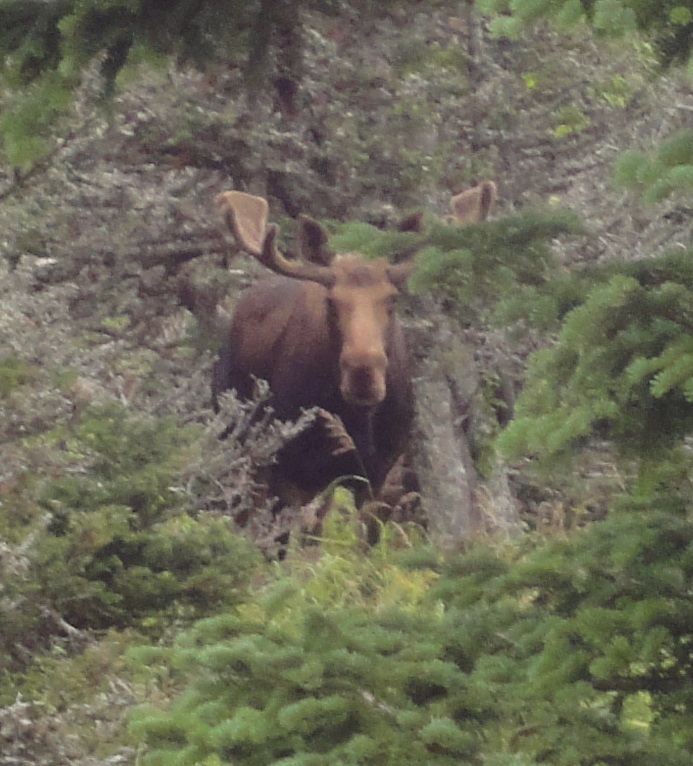 He looked meaningfully at us then continued to graze. We gawked for a few minutes then continued on. As we neared the halfway point, we approached the sea and the headland opened up. A view of the headlands from the road below. The last leg back was uneventful (“How much farther?”), but it was a real joy hiking with these guys! Three brothers, 8 – 12, who made their own joy and shared it with the world! 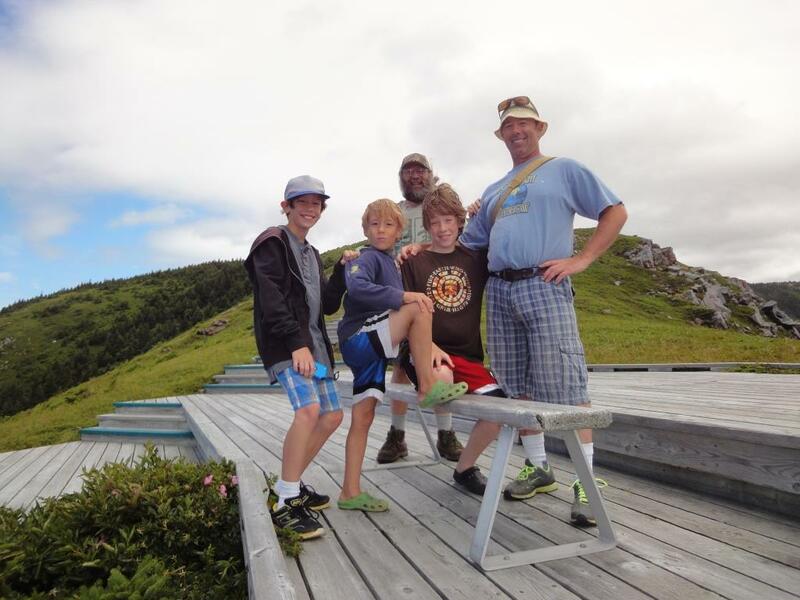 After lunch in Chetticamp at an Acadian restaurant (meat pie, fish cakes…kraft dinner for two of the boys) we took a 15 minute hike around a bog. I love bogs, they have such an interesting ecosystem, and this one was spectacular. It’s actually a “sloped fen” with numerous pools that have sphagnum moss covering varying degrees–most were completely covered, but a few were open. I didn’t take as many photos as I would like, I was distracted by the place. Like most bogs, it has carnivorous plants: Sundew, Bladderwort and the most numerous her, Pitcher plant. 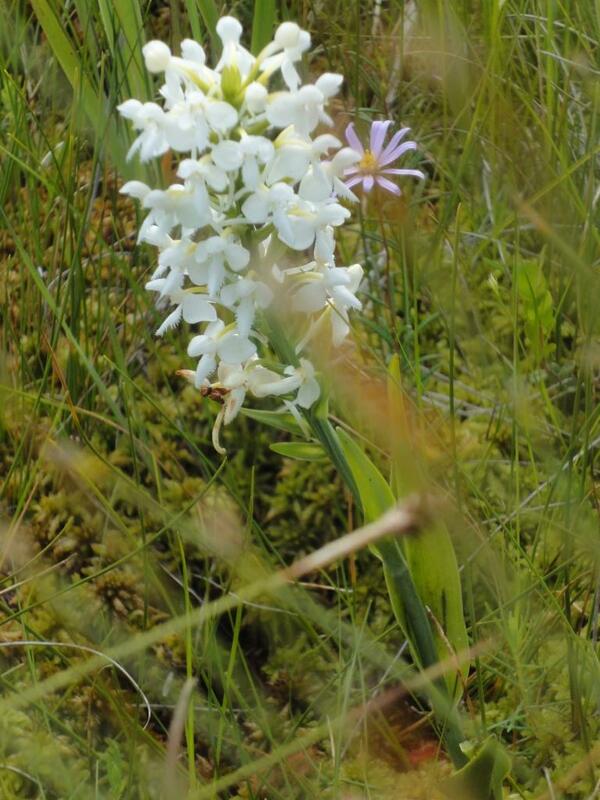 It also had a few beautiful flowers including several orchids. Another fascinating fact about bogs is their harsh nature. They are hot in the summer and cold in the winter (at least in the microclimate) and very nutrient poor. They are undrained and the sphagum moss makes it very acidic. In addition to cedar and balsam, they also had Eastern Larch (what we know commonly as Tamarack). Despite their small size, some of these trees can be very old because they grow so slowly in the nutrient poor environment.